In the United States, the drug approval process is lengthy and time consuming, with only one of every 5,000 drugs that enter preclinical testing making it to the market. One of the most important steps of this process is laboratory testing, which can take up to three and a half years and is performed before a drug is given to a human or animal subject. The drugs are tested on cells cultured in vitro to predict how the human body may respond. Only after successful experimentation has occurred at this phase can a drug be tested on animal subjects and eventually on humans in clinical trials. Given the narrow percentage of drugs that are ever approved, pharmaceutical companies spend countless hours and billions of dollars every year to develop and test drugs that eventually turn out to be unsuccessful. In addition, many drugs pass laboratory trials but fail in the animal testing stage, causing unnecessary harm to animal subjects. This is due in part to the inaccuracy of in vitro laboratory testing methods, which test the effects of drugs on cultured cells but provide no clues as to how the more complex mechanisms of the human body may react. ​The liver is a particularly interesting subject for a 3D printed model, as it is primarily responsible for regulating and metabolizing chemicals in the body. This means that after a drug enters the bloodstream, it must be processed in the liver prior to excretion from the body. In addition, some drugs are administered in an inactive form, and only function as intended after being processed in the liver. As a result, researchers must understand how a new drug impacts the function of the liver before attempting to test it on human subjects. For example, it would be important to know whether toxins will build up in the liver if an overdose occurs. By developing a 3D model that captures the microarchitecture of a liver system and incorporates its various cell types, we aim to help researchers answer these questions without necessitating studies on living subjects. To combat problems with laboratory testing in drug development, our team’s goal is to develop an organ-on-a-chip model that more accurately resembles the complex mechanical, structural, and cellular properties of the liver. 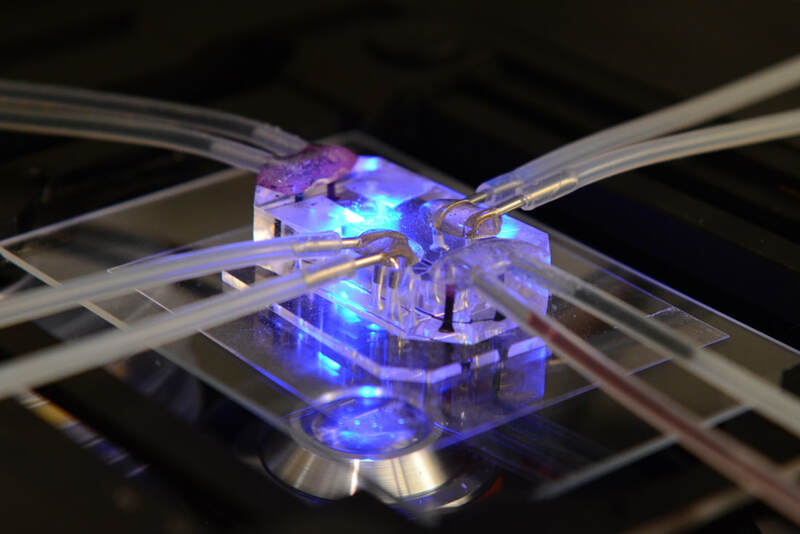 An “organ-on-a-chip” is a microfluidic cell culture device that contains hollow chambers inhabited by living cells. These chips are designed so that cells are situated in 3D arrangements which mimic the architecture, microenvironment, and other properties of a certain organ or tissue. ​For our project, we intend to use novel biomaterials, microfluidic technology, and 3D printing to create a liver model that is both biologically accurate and cost-effective. We hope that our design will provide an alternative to petri dish culture methods that is more accurate in predicting real-life, in vivo responses to pharmaceuticals. Team MICRO is taking advantage of the state-of-the-art technology available at UMD to complete this project. We are fortunate to have access to equipment in the University of Maryland NanoCenter to create our microfluidic devices. After device fabrication, we are using the Nanoscribe Photonic Professional GT 3D printer to directly create microchannels in the device. Our design has multiple key features that allow it to simulate the behavior of cells in the liver. Using the Nanoscribe, we are able to print channels that resemble blood vessels in the liver called sinusoids. We can even create tiny pores, called fenestrae, on the sides of the channels that allow for the exchange of blood with the surrounding cells. The Nanoscribe allows us to produce these features on a physiologically accurate scale and with a level of precision that has been unattainable with other technologies. After printing the channels, we can then add cells to the surrounding environment in the microfluidic device, where they receive nutrients the same way that they would in a real liver!